 Prosecco for spring Spring is jumping off to an early start here this year, and crisp, sparkly Prosecco is a great way to hail the season. Simple, fresh, clean and well-balanced, Rustico is a very refreshing fizz. With daylight saving time having returned a few weeks earlier than usual this year in the U.S. and Canada, and yesterday's local temperature soaring to a summerlike 81F, it's looking a lot like spring even if we are still a week short of the Vernal Equinox. It's none too soon for me, after a relentlessly chilly if snow-free winter, and yesterday's sunny skies inspired me to rush the season with a light dinner salad and a bottle of crisp, sparkly Prosecco, a fine match for a spring or summer evening. I've celebrated the affordable virtues of Prosecco often, so let's just do a quick recap, then move right on to my tasting report. The wine is made in the stretch of Northeastern Italian plains and hills between Venice and Trieste. Most of the more highly regarded bottlings come from the villages Conegliano, Pieve di Soligo and Valdobbiadene, so look for those names on the label. Prosecco is the name of the predominant grape, sometimes blended with Pinot Bianco and the local grape Verdiso. The wine may be made fully sparkling (spumante), lightly sparkling (frizzante) and, occasionally, without carbonation. Most of the Prosecco you'll see in export, though, is sparkling, closed with either a Champagne-type cork or, occasionally, a beer-bottle cap. These sparkling wines are not made by the labor-intensive Champagne process in which the bubbles come from fermentation in the individual bottle; rather, Prosecco was one of the first wine regions to develop the simpler Charmat or tank process, in which a large vessel of wine is carbonated in bulk before being bottled. Although this process is not highly regarded, it seems to work in Prosecco, where the wines - if not comparable to the potential depth and character of Champagne - are almost always crisp and enjoyable. Prosecco is made variably from bone-dry to somewhat sweet, and unfortunately, there's usually no way to tell from the label. Check tasting reports or ask a knowledgeable merchant if you need to know before you buy. Note also that Prosecco rarely carries a vintage, and it's best drunk up young and fresh. Again, a trustworthy merchant is your best line of defense against getting stuck with old inventory. Today's tasting, a non-vintage Prosecco labeled "Rustico" from the producer Nino Franco, is an excellent example, bone-dry, crisp and clean. It was a delicious way to greet springtime. My notes are below. FOOD MATCH: It made a fine match with a simple dinner salad in a light vinaigrette, topped with thin slices of Veneto salami and a cross-cultural but delicious scoop of pimento cheese. VALUE: No argument with a price below the middle teens for a fresh, high-quality Prosecco from Valdobbiadene. WHEN TO DRINK: Prosecco is best when fresh. In the absence of a vintage date, look for a source with high turnover and, ideally, a quality merchant who can be trusted to keep stale goods off the shelf. Nino Franco's wines are widely available. 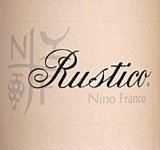 Check prices and find vendors for his "Rustico" on Wine-Searcher.com.